Kingmax has unveiled its iKey – a tiny USB fingerprint reader that is designed to secure confidential data without having to worry about your passwords. Aimed for Windows users, this device can be used to login and encrypt or decrypt a single folder or file by simply using your fingerprint. For just 0.05 second, it will be able to scan your fingerprint and lock or unlock your device, too. To use, plug it into your device via USB, and an auto-installation wizard will pop up. Simply follow the instructions to install the program and you’ll be able to upgrade your device’s security. The iKey also supports 360-degree scanning from any angle. Ten sets of fingerprints can be setup, as well. The iKey is Windows10 Hello certified, but it is compatible with Windows 8 and Windows 7. 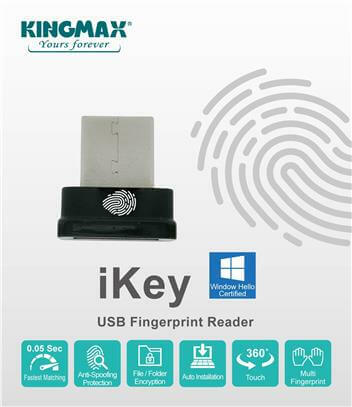 Kingmax iKey-Tiny USB Fingerprint Reader will be available soon. However, its price and its availability are yet to be announced. For more information, visit Kingmax website.